In 2016, skinbetter science® set out to create a new paradigm in skincare, not only for patients, but for the physicians, nurses, aestheticians and surgeons who help patients achieve beautiful skin. Our award-winning products are backed by decades of rigorous clinical research (in powerhouse products like Restylane® and Dysport®) and furthered by a continued commitment to the study of skincare science. skinbetter products are purposefully developed and only available through authorized providers. This model supports physicians and consumers by establishing genuine patient-practice relationships. We’re not just another skincare company. We employ accomplished science to create genuine connections with our providers and real life results for their patients. To us, accomplished science represents the deep knowledge and rigorous study of skin and skincare chemistry. We believe remarkable results can be achieved simply, through purposeful product innovation, which is why we leverage advanced chemistry to help skincare products do more. When you’re happy with your skin, you feel more beautiful and confident. These satisfying results are best achieved by working closely with a skinbetter science authorized physician who can help you find the right treatment for your skin. Just like the perfect hair stylist or aesthetician, when the right product comes along, you’ll never go back to your old favorites. Our patients appreciate that to see results, our products don’t require a tedious multi-step process. In addition to being scientifically advanced, skinbetter offers an uncomplicated approach to skincare. 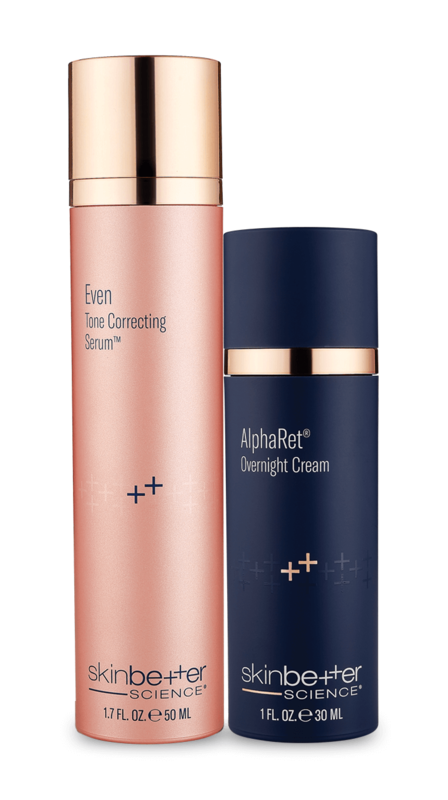 One product can deliver remarkable results; two to three skinbetter products can change how you feel about your skin. Either way, skinbetter products ensure that real results are possible in your real life. Restylane® and Dysport® are registered trademarks of Galderma. Sign up to receive updates on skinbetter science, including new product announcements. By filling out this form, you are opting in to receive marketing emails from skinbetter science.